Singer Aaron Lewis is best known as the front man of the hard rock act Staind, which has had a number of huge radio hits throughout the ’00s. With his new album, The Road, he’s wholeheartedly embraced country music. We recently phoned him on his cell, where he was hunting deer in Texas with a bow and arrow. (“I’m insistent on using a bow and arrow,” he says.) We talked about the album and U.S. tour which, after wrapping up a couple of dates this week, will pick up again in January. You grew up in Vermont. Talk about what is was like growing up and what kind of music you were exposed to initially? I grew up very country. It sounds cliché, but I was a country kid long before I was a rock star. The first music I ever heard was my grandfather’s country. That was Merle Haggard, Johnny Cash, Waylon Jennings, George Jones and Charlie Daniels. I was born in 1972, so I heard whatever was on the radio in the mid-’70s. I’m not an angry young man at this point. I have a wife and three kids and have responsibilities and I see things differently than I did ten years ago. Talk about your first foray into country, the 2011 EP Town Line. What made you want to explore a different musical genre? That was my first have at it. The first country song I ever sat down and tried to write was “Country Boy.” My draw to country music was starting to come around as I get older. I feel what’s going on in that old traditional country more than I feel a connection to the angry young man that I’ve written about. I’m not an angry young man at this point. I have a wife and three kids and have responsibilities and I see things differently than I did ten years ago. 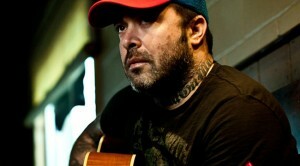 After you had just put out a country album, was it strange to return to Staind for this past summer’s tour? We were on tour all last summer. We played Australia and we did a couple of tours in the States. We finished it up with the Uproar Tour, which was us and Godsmack, Shinedown and Papa Roach for some of it. Everything has to come to an end. It came to the end of the touring cycle for the last record we put out which happens to be the last album of our contract. We wanted to end up as free agents at some point. After 15 years of being out on the road together, we were ready for a break. [Guitarist] Mike [Mushok] is doing his own thing. He has irons in the fire. I got this going on. It was time for us to take a break from being stuck from being stuck to each other for 20 years. I thought Staind was one of the highlights on Uproar if only because the performance didn’t have too many bells and whistles to it. That’s always been the deal with us. We’ve always tried to have a good solid light show that creates a vibe. Not so busy, flash and craziness going on. Other than that, it’s been about letting the music speak for itself. Your voice seems particularly suited to the music, particularly on “Lessons Learned,” where you sound a bit like Johnny Cash, who’s even mentioned in the lyrics. Didn’t know I could sing that low, did you? It’s the first song that I ever approached the vocal from my talking voice rather than my singing voice. In “Red, White & Blue,” you sing about how your grandmother worked at a factory and your grandfather “worked the beer joints.” Is that autobiographical? He “worked all the beer joints in town trying to forget the memories he made.” He was trying to forget the memories of World War II. Yes, it’s autobiographical and so is “Country Boy.” I write all the songs. The first song I ever recorded in my entire career that I didn’t write is “Granddaddy’s Gun.” I sat down to write my version of that song on multiple occasions and it just never happened. We recorded the album in a total of 30 hours and I was trying to record an album while I was out with Staind and on that one day off I would fly into Nashville to record. It was a blur. I had nine songs and didn’t have the time or energy to cram another song in. Talk about the Rhett Akins/Dallas Davidson/Bobby Pinson-penned “Granddaddy’s Gun.” What drew you to that track? I’ve been good friends with Rhett Atkins for a while. It’s a song that Rhett, Dallas Davidson and Bobby Pinson wrote together. We were in hunting camp sitting around a campfire and somebody had a guitar and played that song and I totally related to that song. Everything about that, including my grandfather saying, “A gun is like a woman, it’s all about how you hold her.” It was perfect. I’m friends with Rhett and it’s the coolest respect for my friend type of thing to record it. You hope that as a creative person who sits down and writes songs and records songs – you hope that people like what you’re doing. I’ve learned firsthand that some people don’t. What’s it been like trying to get approval out of Nashville? It’s been an interesting journey. It has. It’s not over by any means. I’ve still got a long way to go. The song “Forever” is doing pretty good. I’ll be lucky to be in a situation where I’m getting spins and the charts will freeze for the holidays for everything else. You hope that the people who are hearing it like what they’re hearing. You hope that as a creative person who sits down and writes songs and records songs – you hope that people like what you’re doing. I’ve learned firsthand that some people don’t. I have an eight-record career preceding this and there are people who really want to hear me playing Staind stuff and don’t necessarily want to hear — don’t take this the wrong way — their favorite rock singer singing country when they might not like country at all. It has been an interesting run. I would think playing these small clubs must be fun. This tour that I’m on right now is great. I’m playing Billy Bob’s in Forth Worth and tonight I play Nutty Jerry’s out side of Houston. These are honkytonk places with the mechanical bull in the corner and the whole deal. The vibe is awesome because that’s what I’m doing.